My Facebook page isn’t huge…but it’s growing. While my For The Interested newsletter is closing in on 12,000 subscribers, its Facebook page currently only has 2,200 fans. But the page’s posts are reaching an average of 1,185 people which is a big percentage of my audience — especially considering it’s happening without paid promotion of the posts. As you can see below, this is almost double the reach I got a month ago. I adopted the following nine practices — they may not work for everybody, but they’re certainly working for me. 1. I don’t post links. Facebook doesn’t want us to send people off of Facebook. Therefore, its algorithm favors posts that feature content which lives on Facebook as opposed to links that lead people to other websites. This means if we post content natively on Facebook — text posts, photos, or videos — Facebook consistently surfaces that content in more of our followers’ news feeds and we get bigger reach. With this in mind, I’ve almost completely stopped posting links to my website and instead create native versions of them to share on Facebook. Typically, I post them on Facebook as a photo post with a lengthy caption that includes either the full article or a condensed version of it. 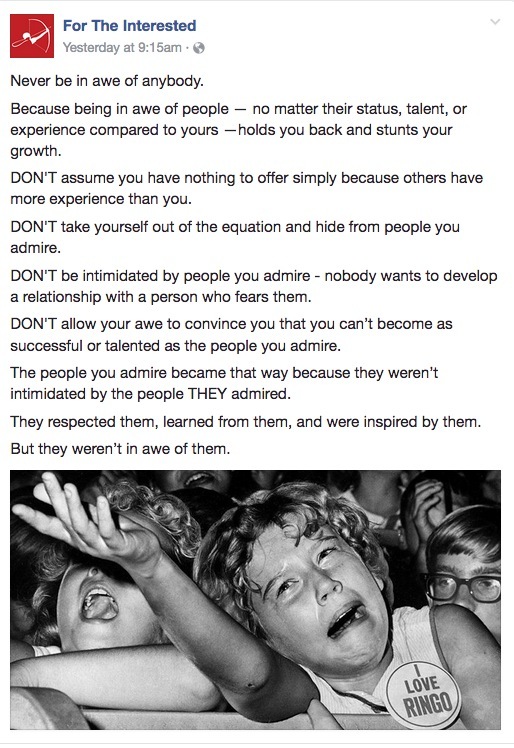 For example, here’s a post I wrote about why you should never be in awe of anybody. I’ve adopted this strategy because the main goal of my writing is to get it seen by as many people as possible (and ultimately convince them to subscribe to my newsletter). So I optimize my posting strategy to do whatever will expose the most possible people to my writing — it’s about consumption, not clicks. This decision to stop posting links has been the single biggest driver of increased reach for my Facebook posts. When I still occasionally post a link on Facebook, it reaches half as many people as when I post natively. 2. I write longer (and better) captions. Facebook’s algorithm is heavily influenced by the engagement our posts generate. The more people like, comment, share, or click our post, the more distribution it will get. With this in mind, I now write longer captions on my Facebook posts — captions long enough to trigger the “See more…” button for readers to expand the full caption and read it. Doing this — assuming the caption is compelling — creates an opportunity for engagement (a click of the See more button) that doesn’t exist with a short caption. It’s consistently led to more clicks on my posts, which in turn made them more engaging and led to more reach. 3. I use eye-catching images. The first step to a successful post on Facebook is to catch people’s eye as they furiously scroll through their news feed. If we can’t get them to at least stop for a beat to notice our post, we’ve got no shot at getting them to engage with it. I try to ensure everything I post includes an image and to make those images as compelling as possible —something that will stand out from what people typically see in their feed. 4. I post less often. I used to post several times a day and let my schedule dictate my content. If I decided to post three times a day, then I had to come up with three things to post — even if it meant including content that was just OK. But I recently switched that up and now post once a day with an emphasis on only posting high-quality stuff. This has helped drive my increased reach because the better the quality, the better the performance and because my own posts no longer compete with each other for the attention of my audience. Less is more. At least it has been for me. 5. I engage with comments. I’ve always been good about engaging with the comments on my posts, but this past month I’ve made it a rule to at least Like (and often reply) to any comments I get. It’s good for community building and drives the engagement that impacts Facebook’s algorithm. 6. I tag relevant Facebook pages in copy. If you’re going to mention a person, place, or thing that has an official Facebook page, make sure you tag that page in your post copy. It expands the reach of your post to the feeds of people who may be fans of those things you mentioned — and will show some of them your post even if they’re not fans of your own page. It also helps ensure our own fans who are interested in those things will be more likely to see that post. 7. I post when most of my followers are online. 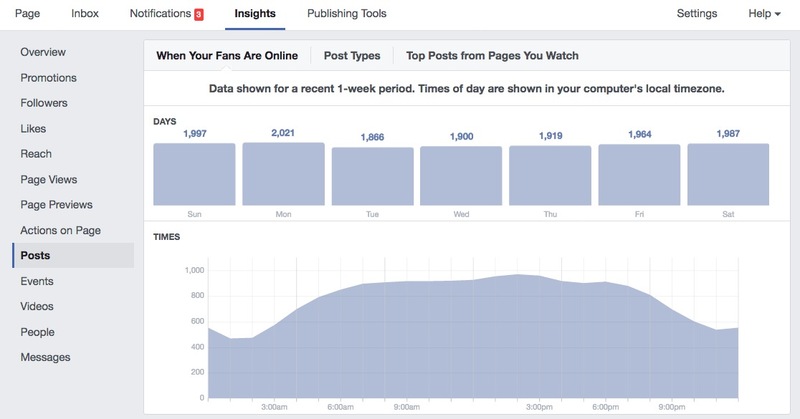 In our Facebook page Insights we can see a chart revealing when our page followers are typically online. I noticed the peak times for my fans’ Facebook use is mid-afternoon, so I’ve started to post more often during that time frame. I still mix it up to reach different people and it’s not clear how much of an impact it has since Facebook is so algorithm driven anyway, but it’s worth keeping in mind. 8. I invite people who like posts to like the page. One of the best ways to get more people to see our posts is to get more people to become fans of our page in the first place. Here’s an easy way to do that. Click to see who has Liked any individual post on your page and when you do so, you have the opportunity to invite any non-fans who liked the post to like your page. 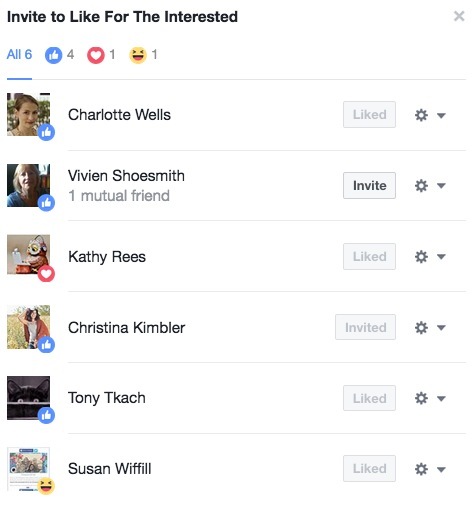 Here’s what it looks like when I click the Likes on a recent post — you’ll see it gives me the chance to invite a person who liked my post but isn’t yet a fan of my page. I’ve done it with all my recent posts and it’s definitely helped grow the page. 9. I study the results. My final tip is something that’s worth doing in any project you take on because it’s the key to improvement— you’ve got to experiment and study the results. Facebook gives us a ton of data about everything we do on the platform and it’s important to analyze what’s happening when we try out different approaches. That’s how I discovered these tips and how I continue to find new ones as I go. If you’d like to follow along as I continue to experiment and learn, subscribe to my For The Interested newsletter below.